We have managed to carve out niche for ourselves in the field of manufacture, supply and trade of Taping Machines. 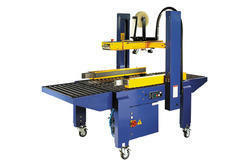 These taping machines are highly popular and find extensive application in several industries. These could be installed with ease in least amount of time. We are a coveted organization in the domain of offering Taping Machines to the clients. Developed by our industry experts, these taping machines are recognized for their high durability and superlative performance for long period of time. These taping machines are manufactured at par with the set industry standards and are in huge demand among our client base. To add on, these taping machines are available in excellent technical specifications.